Life With a Whisk: An honest muffin. I can't recall having been as big a fan of lemon poppy seed than when they came five to a pack. Given today's normal varieties of muffins, I feel a magnetic pull towards sour cream coffee cake muffins or the spiced options and lemon poppy seed is often shafted. 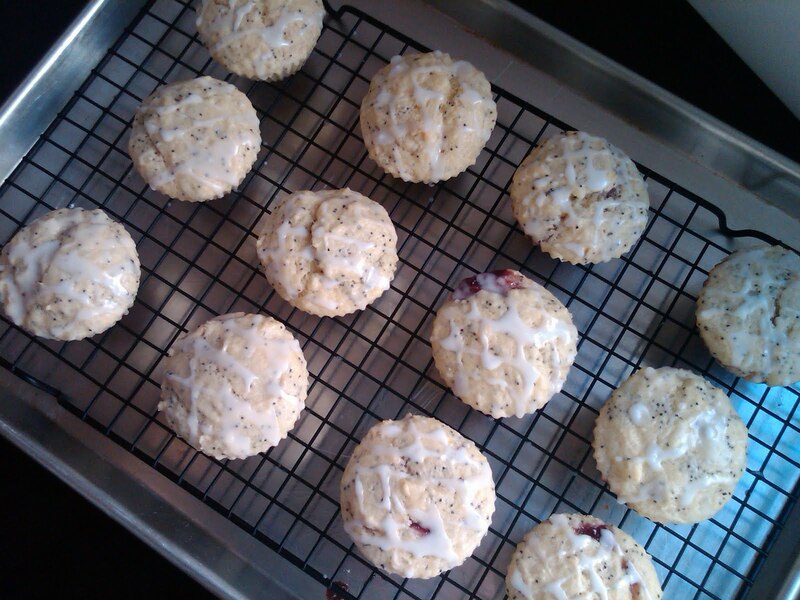 This week, however, our Tuesdays With Dorie assignment was for my beloved mini variety, only in full size form and with the optional additional of jam that I took full advantage of, as chosen by Betsy of A Cup Of Sweetness. Despite my early fondness for the lightly scented lemon muffin with poppy seeds suspended throughout, this was my first attempt at baking them. The two-bowl wonder of a recipe really could not be any more simple. I threw the dry ingredients together, then the wet, combined, and off into the oven they went in less than ten minutes. Half of them got the star treatment with a belly of raspberry jam, but that additional dimension wasn't all that necessary. It's an honest muffin. Straight-forward. 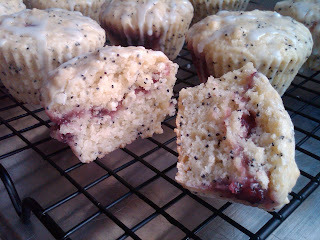 Despite the raspberry jam and lemon glaze, you know that at its heart, it's just a lemony muffin with the perfect proportion of poppy seeds. And I love Bonne Maman raspberry jam, but I don't need to search for it in every bite -- the cake is just so good alone. With or without the bells and whistles, if I were to wake up to it every morning, life couldn't possibly be so bad. Gotta love that Costco!! YOur muffins look so good! Great idea to stick something sweet in the middle..yummy!! Mmmm, love raspberry jam, but all I had on hand was strawberry. Great looking muffins you've got! Thanks for baking with me this week. This is definitely one of my new favorites. Yours look great!